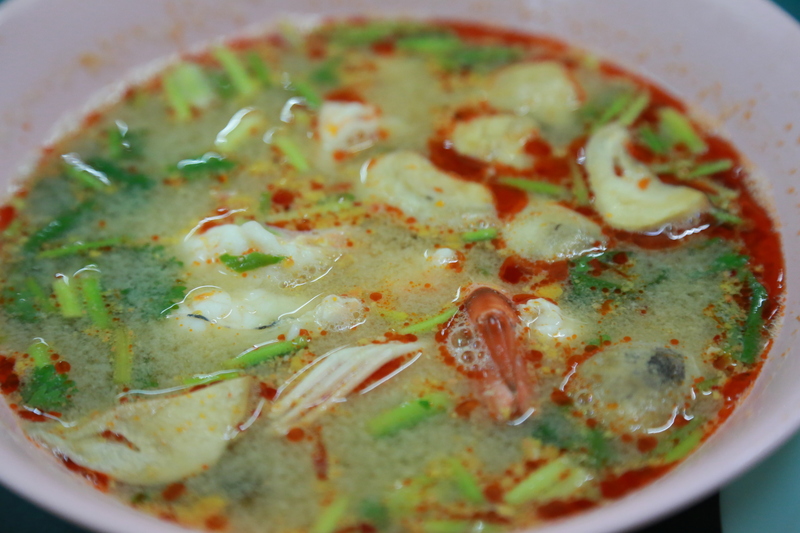 Few dishes and even fewer soups, if any, are as good as Tom Yam Kung, the famous Thai shrimp soup. Unfortunately there are quite some pit falls in making it. Mitr Ko Yuan avoids them all. The soup is delicious and tasty with a good acidity base. One of the better once in town. The owner does his part of the job to create a good atmosphere. Mitr Ko Yuan opened their doors in 1966. Despite their popularity they have never expanded. And they have never changed, the hand-written menu from the opening year that still is posted on the wall. And to be honest the prices haven’t changed that much either. It’s gone from 10-15 Bath a dish to 60-80 Bath a dish. That’s almost 50 years in between. 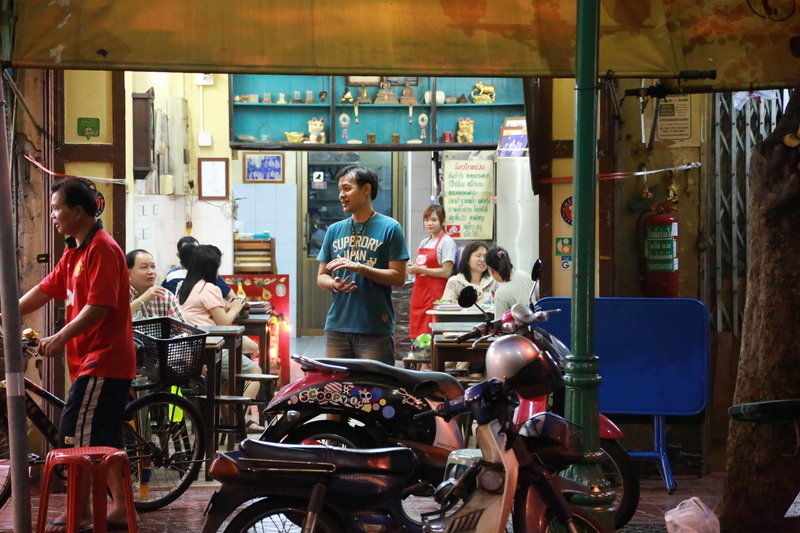 It’s situated in an archetypical Bangkok Shophouse. A small room inside, behind the big wooden doors, and only a handful of tables. The combination of being popular among locals as well as tourists might force you to give it a few minutes on the pavement before you earn your right to sit down. But it’s well worth it. In the 40 minutes I spent there, it was constantly 2 to 4 persons outside, just waiting for a table. And that’s in an area where there is at least 10 very good eateries inside a range of just 100 meters. Tom Yam Kung comes in many dresses. In theory, it isn’t a very difficult dish to make, looking at the ingredients and the process. Rather straight forward many will say. Unless you make a stock like P’Aor, you don’t cook it for hours. But to succeed in getting the right balance you need the skills of a true Chef. When well made, which doesn’t happened to often even in Bangkok, you forget any sorrows you might have for the time the meal takes and a couple of hours more. The Tom Yam Kung here comes with medium sized shrimps and has a delicious acidity that brings forward all the aromas and tastes covered in the broth. It’s the third time I have visited Mitr Ko Yuan and it has never disappointed. 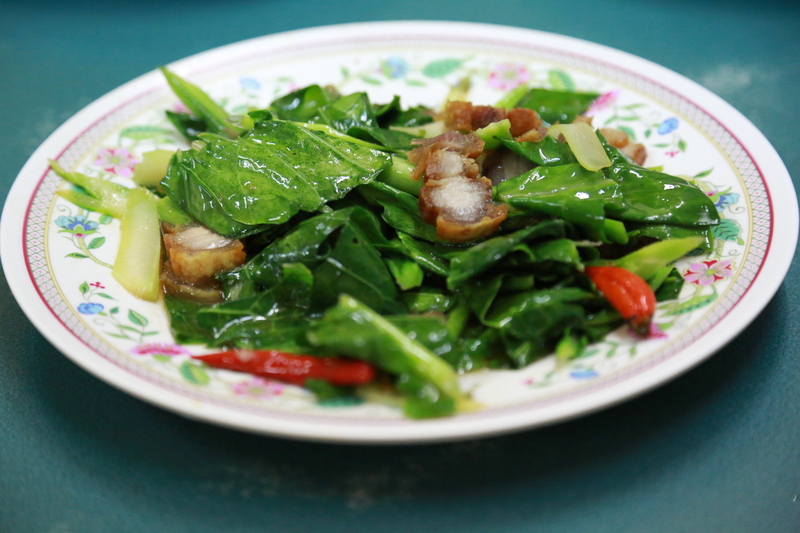 This time I also ordered another dish, the stir fried kale with crispy pork. Like the Tom Yam Kung, it has distinct flavors, with a bit of saltiness from the soy sauce as a base. The kale is fresh and is only given a quick stir in the wok. The crispy pork is also delicious, but don’t just jump on to it if you’re teethes have been on duty for a life time. 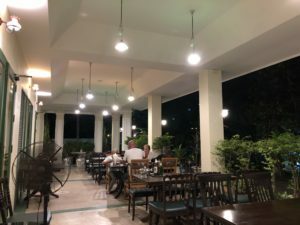 Mitr Ko Yuan obviously have a very good cook and is using quality ingredients in the preparations, so I have no doubts that the other dishes on the menu will be well made with distinctive flavors that will arrange a good party for your taste buds. 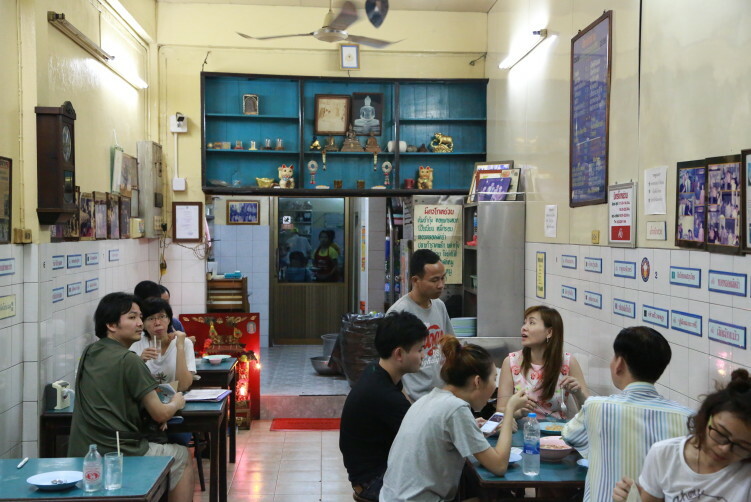 They have divided the food served into different categories: stir fried, snapper dishes (fish), clear soups, hot and sour soups, prawns, spicy salads, cuttle fish, vegetables, shells like soft boiled cockles, egg dishes. All in the range of 60 – 80 Bath, except for the snapper dishes that is 170-190 Bath. It’s a great place for a cheap and cheerful dinner alone or with friends. Mir Ko Yuan in Dinso road has a lot of excellent neighbors as well when it comes to eating, being one the most central road for good Thai/street food in all of Bangkok. Krua Apsorn on the other side of Dinso road serves delicious crab dishes. It has about 40 dishes on the menu. Another resto if your in for some duck is Tien Song Pet Yang on the same side of Dinso Road, but closer to the Democracy Monument. And if you head up to Tanao road, you have Pa Tong Ko Sawoy serving perfect Thai donuts. And on the way to Pa Tong Ko Sawoy you can dig in some great red pork at Niyam Pochana in Mahannop road, just around the corner from Dinso road and another 15 meters. read more Food: A wide variety: Stir fried, snapper dishes (fish), clear soups, hot and sour soups, prawns, spicy salads, cuttle fish, vegetables, shells like soft boiled cockles, egg dishes. click here Open: Mon – Fri 11 a.m. – 2 p.m. and 4 p.m. – 10 p.m.
https://sheisfiercehq.com/shop/ cheap viagra 100mg Address: 186 Dinso Road. trusted tablets How to get there: Located in the Phra Nakhon district of Bangkok on Dinso Road Almost opposite the City Hall. Taxi is your best option if not in the area. Bus alternatives to Dinso Road are 10, 12, 19, 42, 89, 96. Very average food, don’t understand the appeal at all. Thanks for your response. It has been good for many years, but you are the second person reporting that the quality obviously isn’t the same any more. What did you order? I will be back at Mitr Ko Yuan next week to check it out. Hi Bangkok bob. Sorry to hear that you’re not satisfied with the Tom Yam Kung. I have eaten here several times and it has always been very good. Not only me, but also many other food columnists in Bangkok consider it one of the best Tom Yam Kung in town. Hope you just have been very unlucky. I will follow up on your comment and do a new visit in July to check it out. Plenty of mushrooms(caps)were floating in this modest size bowl of Tom Yam. I do not recall seeing any lime leaves but the overpowering saltiness may have eliminated the traditional flavors found in this classic Thai soup. Good luck with your future visit there. I found the Tom Yum way too salty and could not taste the lemon grass or galanga. The shrimp(4) were large but overcooked and soft/mushy. The fried pork and kale was delicious though.